Hi everyone, back at the end of February I shared with you our bedtime tips and routine for Blake. My main tip is to make sure you have a good routine which also includes giving Blake a bath every two nights. I have recently been asked to try out the new InfaCare Night Time Baby Bath with Blake. InfaCare's bubbly bath time treats are formulated to be as natural and gentle as possible for babies delicate skin. Both the InfaCare Baby Bath and InfaCare Night Time Baby Bath are ulta mild and PH balanced with long lasting bubbles which make it popular among parents and kids alike. Recommended by hospital midwives and healthcare professionals, the Infacare bubble baths have been clinically tested and developed to promote natural levels of acidity and alkalinity in skin and hair. Reassuringly, each is designed to prevent irritation, and mums say it helps with allergies. Recently launched, Night Time Baby Bath is fast becoming a favourite with mums across the country; with up to 70% describing it as ‘ideal’ for their bedtime routine. I have been using the InfacCare Night Time Baby Bath with Blake for a week now and we are very impressed. First of all a little goes along way and it makes loads of bubbles which Blake loves. The scent is also such a gentle powdery fragrance which to me smells a tad bit like violets. I definitely can say that it is such a relaxing fragrance and I am tempted to use this in my own bath. I'm unable to say from an allergies point of view how this works as in generally Blake hasn't had any issues with his skin. We really do love the new InfaCare Night Time Baby Bath and it's definitely going to be my new go to bubble bath for Blake. Now I just need them to come out with a matching body lotion in this relaxing fragrance. Have you tried Infacare before? If not what do you tend to use? 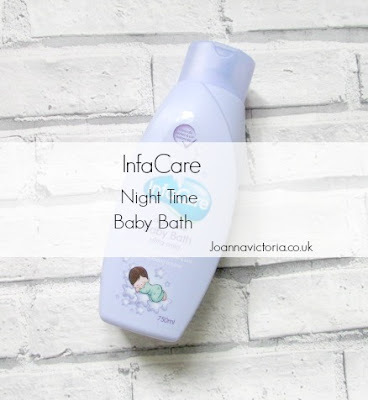 Are you tempted to try out the New InfaCare Night Time Baby Bath? Sounds like a lovely product and yes it would be awesome if there were a body lotion too. Lovely review. I agree with a good bedtime routine. Kids thrive on it. We bath Olly every couple of days or more often if he's been outside in the garden and I love the smell of this baby bath. Smells so relaxing and I'm sure it helps to encourage little ones to drop off to sleep. Thanks for sharing, it looks like a lovely product and I might try some with Dexter once his current brand runs out. We've never actually had a routine with Dexter, he has always let us know when he wants a bath (unless he has been swimming or playing in the mud haha) he's pretty good and usually asks to go to bed around 8ish most nights. My little sister has sensitive skin so infacare might help her sleep and prevent itchiness from occurring. This looks and sounds like a really lovely product. We use Baby Bee on our little one and love it. Lovely review. I always love the smell after bath time. We haven't had a physical bath in the house since we moved in to it back in 2014. Although that might be changing soon. We have used something similar for our daughter and he helped her fall asleep as soon as she was out of the bath in to her PJ's. We can't wait to get her a proper bathroom so we can start using something like this again. Then she may start going to sleep a lot more earlier. I do always find that the fragrance with bubble baths can be pretty dodge - either non-existent or too strong. It's great that this is one you actually like! Oooo we might try this! Sounds like a great bath time product for little ones!